What keeps you coming back to your favorite books, TV series or movies? A good story. Publishers and producers know this and have become masters at using the power of story to draw big audiences. Today, businesses are relying less on buying audiences with paid ads in traditional mass media and are turning to marketing on social media. However, to be successful we must approach this new media with a different mindset. In advertising marketers interrupt the story people want to see with brand promotions that pay for it. Yet, in social media marketers must create the content people want to see. Brands must interest the audience themselves by telling a good brand story. But what makes a good story? To research the power of story my colleague Michael Coolsen and I analyzed two years of Super Bowl commercials – the one time people choose to watch advertisements for the enjoyment of the ads themselves. We wanted to know which ads were the most liked, the ones that drew interest with buzz and votes to finish in the top of the advertising ratings polls. We coded the commercials based on Freytag’s Pyramid, a theory, which breaks down story into five parts: introduction (exposition), rising action, climax, falling action and resolve (denouement). Shakespeare used this story formula to draw mass audience for his five act plays. What we found was the ads that tell a complete story (all five acts) were the most popular and the ads at the bottom of the consumer ratings polls told less of a story (less than five acts). Having all five parts creates a dramatic arc or plot – the formula for being interesting. This is the same story formula you can apply to social media. Act 1: Introduction. Also called the Exposition, this provides the background details, setting, previous events, character, etc. People buy brands for products and service, but also for the back story. Are you sharing your company’s history, people and mission or vision through your social media content? Act 2: Rising Action. This is a series of related incidents or events that build toward a point of greatest interest – the climax. Be careful of flat posts that simply contain the same information over and over in different ways. Think from a much bigger perspective of creating social media posts that build upon each other towards a big action, reveal or turning point that fans and followers can look forward to, check in on and keeping coming back to see. Act 3: Climax. This is the turning point, which changes the main character’s fate. There are two ways to think about this act for marketing. First identify the main character of your social media effort. Are your posts focused on telling the brand story or are they focused on telling your customer’s story. In social media you want to present the brand or customer reaching a turning point of finding a solution or overcoming a challenge by drawing upon brand, product or service strengths. Act 4: Falling Action. During the falling action, the consequences of the turning point are revealed in greater detail. In social media express those results. If an obstacle was overcome, what are the results for the brand or consumer? If an opportunity was seized, detail the many benefits and outcomes that point toward a final victory. Act 5: Resolution. Here all the events lead to an ending scene of the drama or narrative. Conflicts are resolved for the characters which creates a release of tension and anxiety. Here social media content should show the brand or customer winning. Provide a look at the ultimate goal of the brand and its customers. What is your happily ever after? Howard Gossage, a famous copywriter from the 1960s said people don’t read advertising, they read what they like. This thought applies more so now in our digital world. In social media give your audience what they like. People like stories. 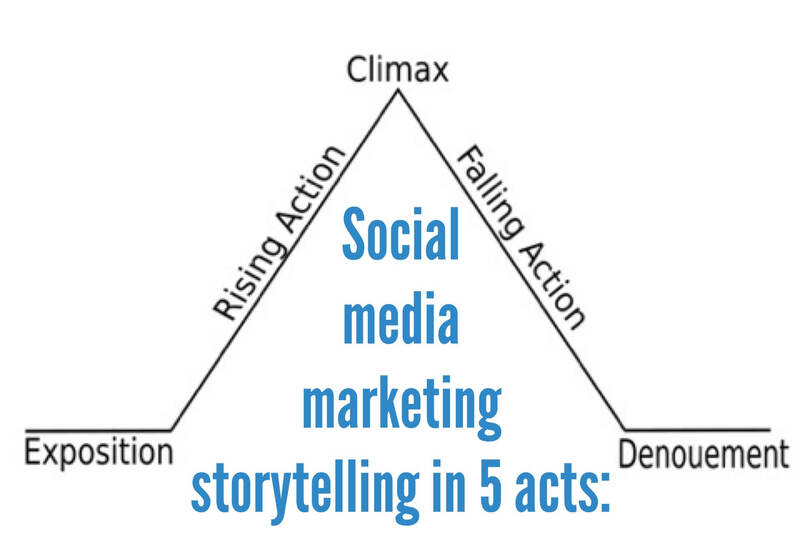 Are you leveraging all five acts of storytelling in your social media content?